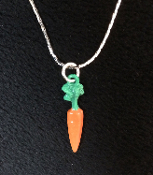 Mini CARROT NECKLACE - Garden Spring BUNNY Miniature Rabbit Charm Jewelry - Detailed, Dimensional Hand Painted Enameled Pewter Metal charm, approx. 1-inch (2.5cm) Tall on 18-inch Neck Chain with safety clasp. 1 'KARAT' Pendant!